The Ministry of External Affairs issued a statement Tuesday in which it tore apart Pakistan PM Imran Khan's televised address on the Pulwama attack. New Delhi: The Ministry of External Affairs (MEA) Tuesday dismissed Pakistan Prime Minister Imran Khan’s offer to investigate last week’s Pulwama attack, citing Islamabad’s inaction in the 26/11 terror strike. “The Prime Minister of Pakistan has offered to investigate the matter if India provides proof,” the MEA said. “This is a lame excuse. In the horrific attack in Mumbai on 26/11, proof was provided to Pakistan. Despite this, the case has not progressed for the last more than 10 years. Likewise, on the terror attack on Pathankot airbase, there has been no progress. Promises of ‘guaranteed action’ ring hollow given the track record of Pakistan,” the ministry added. 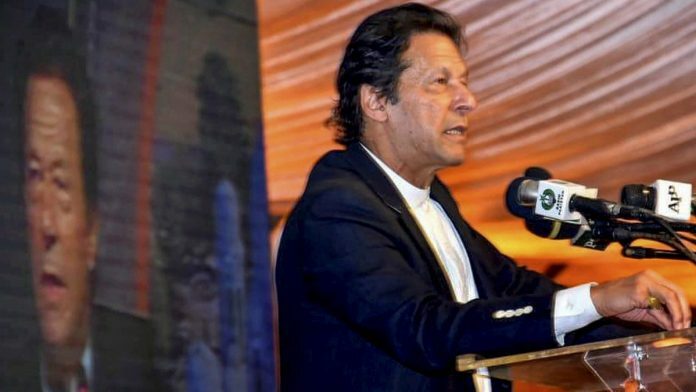 The MEA statement followed Khan’s televised address earlier Tuesday, where he asked India to share “actionable intelligence” with Islamabad in order to the bring the Pulwama attack perpetrators to justice. At least 40 CRPF personnel were killed in the 14 February terror attack in Kashmir, for which the Pakistan-based Jaish-e-Mohammed (JeM) has claimed responsibility. “Disclaiming any link between the terrorist attack and Pakistan is an oft-repeated excuse by Pakistan,” the MEA said. “The Pakistani Prime Minister has ignored claims made by the Jaish-e-Mohammad, as well as by the terrorist who perpetrated this heinous crime. It is a well-known fact that Jaish-e-Mohammed and its leader Masood Azhar are based in Pakistan. These should be sufficient proof for Pakistan to take action,” the MEA added. It also said that the Indian government was not surprised Khan “refuses to acknowledge the attack on our security forces in Pulwama as an act of terrorism”. “Prime Minister of Pakistan has neither chosen to condemn this heinous act nor condoled with the bereaved families,” it added. India also referred to instances where Pakistani leaders were seen sharing public platforms with terrorists like Hafeez Saeed, the UN-banned chief of the Jamaat-ud-Dawa (JuD). The JuD is a front for the Lashkar-e-Taiba, which is believed to have carried out the 26/11 terror strike on Mumbai. “The Prime Minister has referred to a ‘Naya Pakistan’ with a new thinking,” the MEA said. “In this ‘Naya Pakistan’, ministers of the current government publicly share platforms with terrorists like Hafeez Saeed who have been proscribed by the United Nations,” the MEA added. Responding to Khan’s offer for talks, India reiterated that it would be ready to engage in a comprehensive bilateral dialogue only in an atmosphere “free from terror and violence”. The MEA also described as “regrettable” Khan’s insinuation that India’s response to the Pulwama attack was driven by the forthcoming Lok Sabha election. “India rejects this false allegation,” said the MEA. “India’s democracy is a model for the world which Pakistan would never understand. We demand Pakistan to stop misleading the international community and take credible and visible action against the perpetrators of Pulwama terrorist attack and other terrorists and terror groups operating from areas under their control,” it added. President Trump is a prolific tweeter. Now, after almost a week, in response to a question, he has said that he is receiving reports and that a statement would be put out in due course. Also that it would be “ wonderful “ if the two countries could get along well. Note the nuance, moderation, balance. Let the spats be verbal. No war.